Riding on last year’s wave of economic development, officials across our region are sailing through another busy year. Explore how seven communities are supercharging recent developments, how they’re setting the stage for new things to come, and why they’re optimistic about their prospects for the coming 12 months. 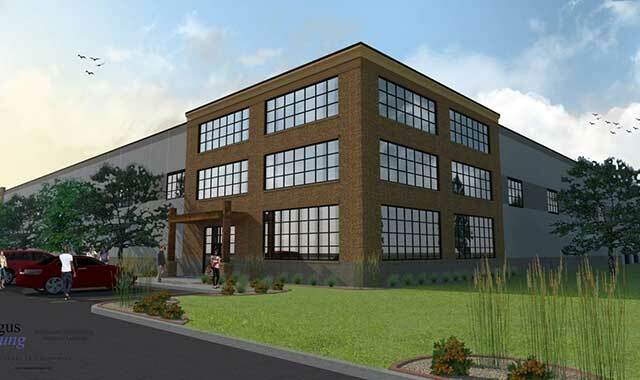 New projects are in the works at Beloit’s Gateway Business Park, where a diverse range of businesses are tapping into the adjacent interstate highway system. Bright sunshine, fertile soil, and just enough rain all set the stage for a perfect spring garden, which in time yields a bountiful late-summer harvest. Just as sun, soil, rain, seeds and planning cultivate a healthy vegetable garden, local economic leaders realize success through ideas, location, design, investors and planning. For cities across northern Illinois and southern Wisconsin, this year’s business development forecast is mostly sunny, with a high chance of economic blossoming. The Interstate 90 corridor and City Center areas of Beloit are blooming with activity this year. City leaders are especially focused on the Gateway Business Park, located near the confluence of Interstates 39/90 and 43. The business park is attracting companies from a wide variety of industries, including advanced manufacturing, food, healthcare, logistics, plastics and real estate development. Current tenants include flavoring ingredients manufacturer Kerry Inc., a distribution center for Staples and food manufacturer Kettle. New projects are taking root this year. Key to all of this development is the park’s prime location at two major interstates. In downtown Beloit, there’s a concerted effort to support entrepreneurs and grow new businesses at Irontek, a new co-working space, business incubator and tech hub located in the recently renovated Beloit Ironworks. The renovated former factory now houses several IT-related companies, including software makers Comply365 and Fat Wallet. “This dynamic and collaborative space was conceived by the developers of the Ironworks to build upon the several other high-tech firms that have located and/or have expanded there,” says Janke. The business climate in Beloit is primed for success both now and in the future. “Along with industrial development, Beloit has seen growth in commercial activity and residential development,” says Janke. He sees continued opportunities for growth in the area’s key sectors, in part because of Wisconsin’s business-friendly attitude. “Manufacturers will continue to see the competitive advantage of doing business in Wisconsin, with its low income tax rates, low workers comp rates and vastly improved business climate,” he says. Recent growth and expansion at the Chicago Rockford International Airport (RFD) has further cemented the region’s relationship with the aerospace industry. The region boasts about 200 aerospace-related companies within 90 miles of Rockford. New education and workforce strategies are bolstering the region’s aerospace cluster. Bryant says local firms are helping to raise nearly $6 million to support the joint Northern Illinois University and Rock Valley College four-year engineering degree program. The first classes began this past fall. “Our young people are now able to get four-year engineering and engineering technology degrees at the Rock Valley campus for approximately $40,000,” says Bryant. While local officials cultivate the jobs of the future, this past year brought an infusion of new jobs, thanks to the new AAR Corp. facility at the airport. This $40 million maintenance, repair and overhaul facility is hiring many highly skilled workers. AAR expects to employ between 300 and 500 people in Rockford within the next three to seven years. In order to ensure a continued supply of these highly skilled workers, RVC’s new Aviation Career Education Center, located across the street, is providing a critical training ground. Students in the Aviation Maintenance Technology Program are guaranteed a job interview at AAR. Since the education center opened several months ago, RVC students already have been applying to and receiving jobs. Bryant believes the new RVC program has the potential to impact the entire region, not just AAR. “This is a synergistic relationship between education and private-sector employment,” he says. Outside the aerospace cluster, other parts of Rockford are enjoying marked growth. Downtown events like Stroll on State and City Market draw large crowds to the neighborhood and its new businesses. The Rockford Trust Building, redubbed the Burnham Lofts in honor of the building’s famous architect, holds 62 new one- and two-bedroom apartments. Two of Belvidere’s largest employers are leading the way in local business growth and development. Lopez-Fettes finds several advantages to doing business in the Belvidere area, including proximity to I-90 and the region’s established industries, plus ample room for growth. Of course, the location also proves fruitful for those who work in other areas but flock to Boone County for affordable housing, Lopez-Fettes adds. She sees potential for continued growth in advanced manufacturing, agriculture, food processing and healthcare, but believes there’s also a need for improvements in infrastructure, utilities, transportation and communications. City leaders plan to improve the Pleasant Street Bridge, which passes over the Kishwaukee River and is a critical throughway for General Mills plant traffic. Meanwhile, downtown Belvidere is enjoying several aesthetic enhancements. Nearly 120 years after being christened the “Hub City,” Rochelle is still a powerful player in the railroad industry. Companies in the food and agricultural sector view the city’s rail presence as leverage in the mass distribution of their products, says Jason Anderson, economic development director for the city of Rochelle and executive director of the Greater Rochelle Economic Development Corporation. Located at the confluence of several rail lines, Interstate 39 and Interstate 88, Rochelle is benefitting not only from a prime location but also its business-friendly climate and infrastructure. Lately, Anderson finds Rochelle’s most exciting agri-business ventures are BrightFarms and MightyVine Tomatoes, two hydroponic growing facilities that together cover nearly 1 million square feet. Elsewhere in Rochelle, opportunities are arising around the movement of frac sand, a product used in the hydraulic fracturing, or “fracking,” process for extracting oil and natural gas. The city owns and operates its own short-line railroad that connects between the Union Pacific and Burlington Northern lines that crisscross the city. Anderson believes the line is a key facilitator to business growth. A strong network of existing businesses in Monroe, Wis., provides the backbone for further business growth in Green County, says Mike Johnson, executive director of the Green County Development Corporation. “I think the main area of our focus is making sure that we have strong business retention and expansion programs, and making sure that we’re a good resource for those businesses that choose to start up and expand right here in Monroe and Green County,” he says. The agricultural, food and beverage, and tourism industries continue to power the local economy. Agricultural staples include Kuhn North America, in Brodhead, and a number of smaller manufacturers of farm equipment. “The dairy farming industry is a big piece of our economy and that also spills into our food and beverage cluster,” Johnson says. Turns out, you’ll find many common links among the top businesses in Green County, says Johnson. Consequently, several businesses in these industries are either stretching out or setting a foundation. New arrivals include Eastland Feed and Grain, in Monroe, which serves local livestock farmers, and Hawks Mill Winery, in New Glarus, a budding family-owned winery. The Klondike Cheese Co. is introducing a full line of yogurt products and a line of Muenster cheese. Expansion projects are also planned at Minhas Brewery and New Glarus Brewing Co. The area’s strong business retention and expansion is good news for the region, but it’s creating an unexpected dilemma. Housing developments for seniors and families are dominating the discourse in Freeport. Developers received city approval to extend Enterprise Zone benefits, a tool Gitz says will offer a trial effort at fast-tracking housing starts. When it comes to senior housing, the new WinnPrairie development promises to deliver 32 two-bedroom independent living units and 21 private memory care units. Gitz calls it the “next generation” of senior housing. The Parkview Home is also adding a new memory care unit. Housing isn’t the only section heating up in Freeport. New gains in the retail sector are taking root as national chains expand to smaller markets, like Freeport. New endeavors at the JJ Ventures strip and XSite Realty’s phase two strip center are two examples, says Gitz. Surprisingly, opportunities are opening up for transportation systems, as well. Pretzel City Transit, a partnership between the city and State of Illinois, is answering the need for bus service in and around Freeport. The group recently added transportation options for workers at Berner Food & Beverage, a manufacturer located 12 miles north of Freeport in tiny Afolkey, Ill.
Strong infrastructure and solid plans to entice new businesses are facilitating economic growth in Dixon, Ill. Efficiently tapping the region’s many resources is crucial to attracting business, says John R. Thompson, president/CEO of the Dixon Area Chamber of Commerce & Industry and the Lee County Industrial Development Association. These infrastructure improvements are part of a $10 million investment along the Rock River and the city’s historical district. “Boat docking facilities are also being added this summer to establish a direct river connection into the downtown off the Rock River National Water Trail,” Thompson adds. It’s the city’s network of roads that provide a critical avenue to business attraction. Thompson sees lots of promise in the area’s inventory of build-ready and near-build ready sites, which are primed for development, thanks to city leaders’ proactive growth strategy. The city is establishing a business development district (BDD) aimed at prime, future retail developments along the interchange between I-80 and Illinois Route 26. “Implementation of a BDD will allow a cost-effective means to bring significant retail investment to that area,” says Thompson. And, intergovernmental collaboration around Dixon is helping to lay additional foundations for growth. With varied industries firmly planted in northern Illinois and southern Wisconsin, the region’s economic garden features resilience and robust diversity. These elements, growing in a business-friendly climate, alongside municipal collaboration and a strong infrastructure, promise another strong season of economic success in our region. This entry was posted on Thursday, March 30th, 2017 at 12:00 pm	and is filed under Northwest Business Magazine, Top Posts. You can follow any responses to this entry through the RSS 2.0 feed. Both comments and pings are currently closed.